Tarmizi A. Hamid seems like an ordinary citizen, yet he is working on something of great historical importance. The resident of Gampong Ie Masen Kayee Adang in Banda Aceh is a collector of old and rare manuscripts of Aceh history. “I’m not just a collector, I’ve got to study the content of the texts and preserve them so as to keep the younger generation informed of our history,” Tarmizi, 45, said. Tarmizi has no background in history; he graduated in agricultural engineering and works with the Agency for Agricultural Technology Studies (BPTP) in Aceh. “I was very sad to see that other countries are keeping Aceh’s old historical documents and claiming that the texts are their property,” Tarmizi said. His desire to collect old documents was triggered by visits to museums in Malaysia, Singapore and Brunei. He was surprised to find that most of the manuscripts on display came from Aceh. In the museums, the texts are kept and treated as objects of high historical value and significance. He became determined to begin collecting historical texts from Aceh in 1985. 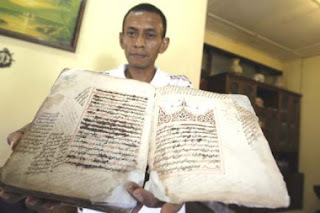 Since then, he has been searching for old manuscripts all over Aceh and even in other provinces like Riau and Jambi. Today, Tarmizi has about 500 texts spanning different themes. The oldest book he possesses is Luhfatul Thulab by Syekh Zakaria Ansari, written at the end of the 15th century or the beginning of the 16th century during the time of the Pasai Kingdom, based in what is now north Aceh and the oldest Islamic kingdom in what is now the Indonesian archipelago. Zakaria Ansari was an Aceh ulama from Persia (present-day Iran). The text describes Islamic laws like fasting, compulsory prayers and holy war. Tarmizi obtained his manuscripts in various ways, including visits to people known to have inherited texts. Most of them were not properly preserved. “Many of the inheritors just gave up on the texts as they didn’t know how to keep or preserve them. Some asked for money,” Tarmizi said. To those voluntarily contributing their manuscripts, Tarmizi offers a copy of the Koran as compensation. As for requests for money, he uses his own earnings and has even sold plots of land to be able to purchase the texts. “Otherwise, the old documents would be damaged and lost along with the history within them,” he pointed out. For their maintenance, Tarmizi has turned a room in his home into a library. To prevent damage from humidity and termites, he uses mothballs and traditional concoctions of spices including cloves and pepper. His love of old manuscripts and passion for maintaining them attracted the attention of the Japanese government some time ago. The Japanese government and the Aceh Archeological Documentation Center restored some of the damaged texts and trained Tarmizi in document restoration and maintenance. “Manuscript restoration is difficult and expensive. Now the paper used for this purpose is only produced by Japan and it’s very costly, around Rp 32 million [US$3,700] per meter,” Tarmizi said. For the rescue of old manuscripts that are near ruin, Tarmizi plans to begin digitalizing them, but again the factors of cost and time are a major hurdle. “I hope the Aceh government and UNESCO will share the responsibility for the speedy rescue of the texts to preserve their contents,” Tarmizi said. Despite the difficulty in preserving his historical texts, Tarmizi has no intention of selling or relinquishing them to any party unless there is a guarantee that the documents will be maintained and utilized for the public interest, especially for studies of Acehnese history. “I don’t want to see Aceh’s historical objects in the hands of unscrupulous people or illegally sold,” Tarmizi stressed. Another manuscript in Tarmizi’s library is the work of Syekh Abdurrauf As Singkili containing a manual of Islamic law in Aceh during the reign of Queen Safiatuddin (1641-1675). Popularly known as Teungku Syiah Kuala (1615-1693), Syekh Abdurrauf was known as a wise judge who created royal law and was also influential on the peninsula of Southeast Asia. Most of the old manuscripts of Aceh are in Acehnese, Arabic and Malay. Many are also kept at Leiden University in the Netherlands and in a museum in Istanbul, Turkey. Dr. Annabel Gallop from the British Library, an expert who studies old manuscripts, said the study of Aceh’s texts was very special. Indonesia’s oldest letters came from Aceh and so did the country’s most beautiful royal letters. archipelago to the southern Philippines, of the 1,600 stamps gathered from what is now Indonesia, 20 percent — and the oldest ones — came from Aceh.